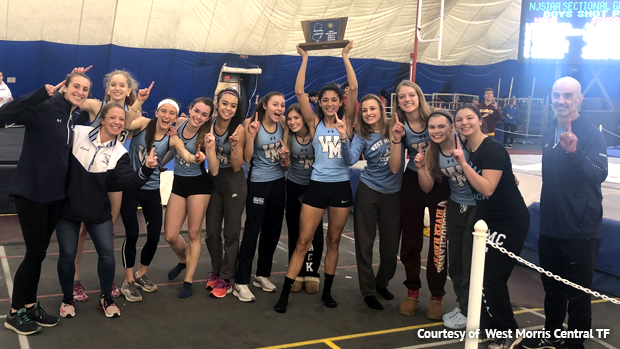 The Scotch Plains-Fanwood boys and West Morris girls made history on Sunday when both teams won sectional indoor titles for the first time ever and both 3,200-meter meet records were shattered at the NJSIAA North Jersey, Section 2 Group 3 Championships at the Bennett Center in Toms River. The girls meet came right down the wire between sister schools West Morris and Mendham with West Morris winning the nail-biter, 65-64. West Morris was clinging to a one point lead with just two events to go when Junior Julia Trethaway capped a remarkable distance double by winning the 3,200 in a NJ. Sec. 2 record and NJ#2/US#6 10:37.58. Earlier in the meet, Trethaway won the 1,600 in 5:01.78. Trethaway's 10:37.58 broke the NJ Sec. 2 record (all Groups combined) of 10:39.19 set in 2012 by Mackenzie Barry of Mendham, and is the second fastest time ever run in any sectional meet. Abby Loveys of Randolph ran the all-time sectional record when she dropped a NJ#1/US#4 10:34.25 at Friday's NJ. Sec. 1 Group 3 meet. Trethaway's victory in the 3,200 gave West Morris a 61-58 lead over Mendham, which received a runner-up finish from Megan Timoney in the 3,200. That three point lead was exactly what West Morris needed heading into the meet-concluding 4x400 as Mendham placed third (4:16.86) and West Morris was fourth in 4:19.68, just ahead of fifth-place Nutley (4:20.35). If Nutley finished ahead of West Morris then Mendham would have won the team title by one point. There were several athletes who shined for West Morris. Senior Crystal Robinson was second in both the 55 dash in 7.55 and the 400 in 61.00, and ran on the 4x400 relay. Sophomore Chelsey Cochrane was third in the 1,600 in 5:27.36, second n the 800 in 2:27.89 and ran on the relay. Senior Allison Keller placed third in the pole vault (7-6). Senior Heather Booth placed fourth in the shot put (31-8 1/2), and junior Caroline Isemann was sixth in the 400 and ran on the relay. 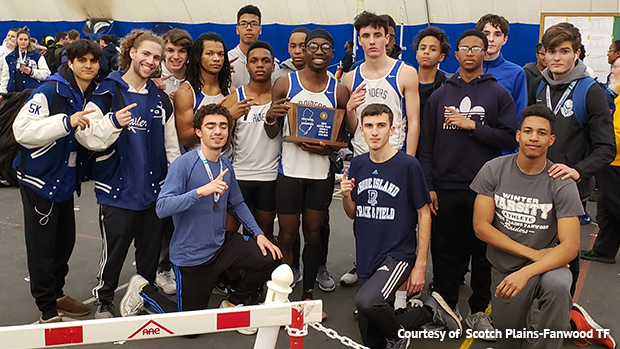 There wasn't any drama in the boys team competition as Scotch Plains continued one of its best indoors seasons in several years with a dominating 72-46 victory over runner-up and defending champion Mendham. The Raiders, which also won its first state Group 3 relay title last month, received a huge performance from senior Jacob Leigh. Leigh won the 55 dash in 6.64, finished first in the 400 in 51.49, placed third in the high jump (4-10) and ran on the winning 4x400 relay that ran 3:30.55. Junior Ian Celardo (11-6) and senior Tyler Dvorin (10-0) went 1-3 in the pole vault for Scotch Plains. Kyle Estivene placed second in the 55 hurdles in 7.79, was third in the 55 dash in 6.83, and ran on the relay. Senior Ben Fleischer finished fourth in the 3,200 in 9:37.10. Senior Brandon Garcia was fifth in the 1,600 in 4:30.74. One of the biggest highlights of the meet was provided by Mendham's dynamic distance duo of junior Jack Jennings and senior Jack Stanley. After Stanley led a 1-2-3 finish for Mendham in the 1,600 with a winning time of 4:23.95, Jennings and Stanley blasted NJ#2 and NJ#3 times in the 3,200 with Jennings crossing first in 9:17.58 and Stanley second in 9:17.61. Both runners demolished the NJ. Sec 2 record (all Groups combined) of 9:21.84 set in 2011 by Tim Ball of Piscataway.